1. Pot of gold and the rainbow. 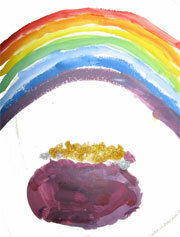 Sketch a rainbow and a pot under it with a pencil. Explain your child about the colors of the rainbow and their order (red, orange, yellow, green, blue, indigo and violet). 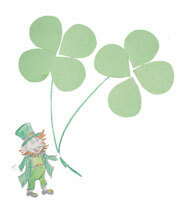 Let a child color it -- you can help him by guiding his hand on the first couple strokes. 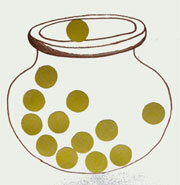 After the painting has dried, make some gold in a pot with a glitter glue pen. Draw the shape of a pot. Cut out a few "gold" coins or any other shapes from a yellow construction paper. Let your child put (glue) the coins into the pot. 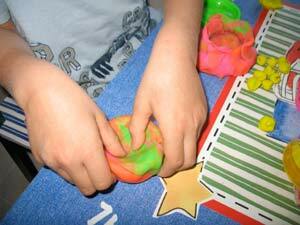 From a ball of a play-dough a child can make a pot by pushing into a ball with his big fingers and forming walls of the pot. 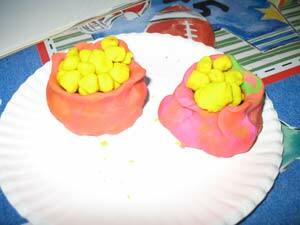 Fill the pot with some yellow play dough gold.